Perhaps it was because they named a teddy-bear prop ‘Macbeth’. Perhaps it was because The Winter’s Tale is the most spectacularly unseasonal title for an open-air summer production. Perhaps it was plain old-fashioned bad luck. Whatever the reason, the early stages of the Pantaloons’ second production (and first summer tour) were beset with problems. The rain poured down on their first run of performances. A missing passport stranded a cast member in Canada only days before their Edinburgh Fringe debut. As a final sting in the tail, the company lost over GBP600 of their meagre resources when Kent-based airline EUjet, with whom they had booked their Edinburgh flights, folded like a decrepit Kentish deckchair. 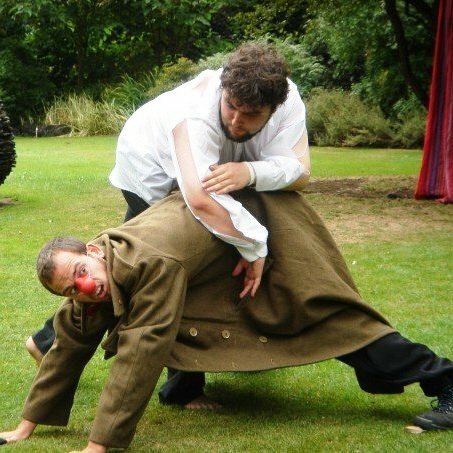 The Pantaloons’ pay-what-you-like performances at Edinburgh’s Royal Botanic Garden attracted enormous crowds, beautiful sunshine and glowing reviews. Clowns interacted with the audience. Loveable rogue Autolycus improvised snatches of stand-up, making Murder She Wrote references and referring to a battered copy of Charles and Mary Lamb’s Tales From Shakespeare. At each performance, the infamous stage direction ‘Exit, pursued by a bear’ was enacted by a member of the audience. At the end of the show, a statue of the dead Hermione comes miraculously to life. The wise Paulina tells us that in order to believe this magical story of hope and redemption, the audience must join the actors in their make-believe: “It is required you do awake your faith”. With The Winter’s Tale, the Pantaloons learned that their clownish ways could be put to the most profoundly moving dramatic effect.